Dr. Daniel Kim was born and raised in New York City. Dr. Kim completed his undergraduate studies at Boston University with a major in Human Physiology. He received his dental degree from the University at Buffalo, graduating with honors in 2015. Upon finishing dental school, Dr. Kim completed his General Practice residency at North Shore University Hospital. 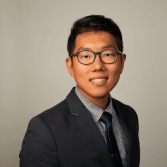 He was selected to serve as Chief Dental Resident and subsequently completed a fellowship in Advanced Prosthodontics and Implant Dentistry at North Shore University Hospital. Dr. Kim is most interested in implant surgery and full-mouth rehabilitations. He stresses the importance of patient education and patient-centered care. In his free time, Dr. Kim enjoys spending time with his fiancé and their two dogs, Hagrid and Ron.